The Company was formed in 2004, from a background in Civils. 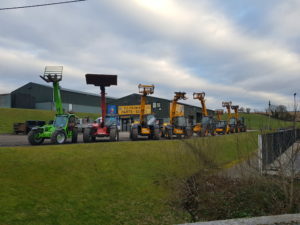 We are conveniently located on the main N13 in the Killyverry Business Park, approximately one mile on the Letterkenny side of the village of Newtowncunningham in Co Donegal. With over 15 years business experience EC Ltd has expanded into one of the largest independent stockists and supplier of site dumper parts in the country, offering a wide range of quality spares for Terex/Benford, Thwaites & Barford. We are constantly adapting to meet the requirements of our valued customers and understand the importance of keeping your equipment onsite and operational. We are dedicated to ensuring optimum satisfaction by providing the best quality parts for your machinery, we pride ourselves on our ability to give an expected 21st century standard by providing an excellent, highly efficient and economic service together with extensive product knowledge and no nonsense down to earth prices to our customers. We endeavour to serve in a reliable, and friendly manner, we are committed to customer service and guarantee a prompt response to all enquiries. We also have a trade counter to accomodate our local customers selling a range of parts, from undercarriage spares, transmission consumables, filtration and hydraulics etc. Along with dealing in equipment such as, Site Dumpers, Telescopic Handlers & Excavators on a small basis whilst specialising in Site Dumper spares nationally. Our reputation has been built on our efficency, and value for money to our customers.